Brand: Brand: Bilingual Books, Inc.
Learning German has never been this easy! 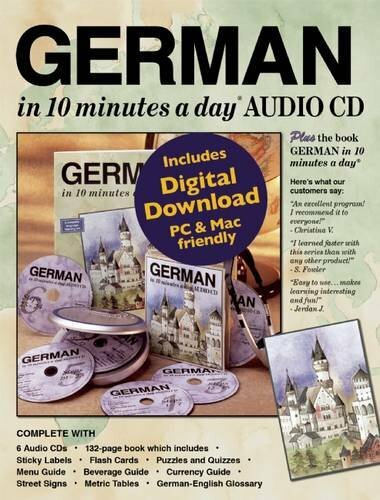 This complete language learning kit includes the "10 minutes a day" audio CDs, the "10 minutes a day" book and the interactive software. The 10 minutes a day program provides step-by-step personalized instruction - introducing a new word and practicing it with you. You'll learn the building blocks of the language so you may expand your conversational ability for any situation and enhance your travel experiences abroad. The focus is on success, practicality and fun! If you have any questions about this product by Brand: Bilingual Books, Inc., contact us by completing and submitting the form below. If you are looking for a specif part number, please include it with your message.